Co-Optimus - News - Our Weekend in Gaming - Where's My Firefight Edition? Our Weekend in Gaming - Where's My Firefight Edition? Despite the plethora of games, everyone seems to want to get back into some Firefight action in Halo 3. Nick "bapenguin" Puleo - "Dawn of War 2 tonight and hopefully some Firefight otherwise." Mike "pheriannath" Katsufrakis - "I'll be hitting up some Last Stand in Dawn of War II as well as testing out the retail co-op modes in Uncharted 2, now that I've beaten the single-player." Marc "DjinniMan" Allie - This weekend is pretty busy, but after hearing my kids singing along during Beatles Rock Band co-op night, I'd guess that will be the game of choice this evening, along with whatever else the kiddo wants to play." 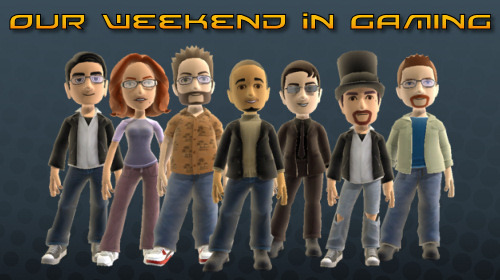 Katrina "ShadokatRegn" Pawlowski - "This weekend will wrap up Mini Ninjas, and hopefully crack open some Prince of Persia or the campaign for Halo 3: ODST. " Jason "OrigamiPanther" Love - "I plan on playing more AI War and, of course, the new Last Stand mode in DoW II. Kudos to Relic for giving me a new reason to be completely addicted to that game. I'll also be wrapping some things up in Brutal Legend, and possibly playing some Firefight in Halo 3: ODST." Jim "txshurricane" McLaughlin - "I'll be playing Borderlands at the Gearbox launch party, and that will probably be it. If I get the chance, I'll hit Halo 3 ODST and Operation Flashpoint 2."